Looking to keep warm during the winter months? Budget Choice Heating & Cooling can install almost any brand of furnace or heating system in your home, including YORK®, KeepRite®, Frigidare and Heil furnaces. If you’re opting for an alternative, we can also install other heating units such as gas appliances. Routine maintenance services are also available to make sure your heating unit is working efficiently. We will perform a thorough inspection on all parts of your system, including the chimney and vent pipe, to ensure and maintain efficiency and performance. Some of the most common furnace problems include electrical circuit problems, malfunctioning thermostat, gas leaks and much more. We offer 24-hour repair services so you don’t have to go a day with a broken furnace. Keep your home warm and cozy with Budget Choice Heating & Cooling. Fight off the summer heat with a new air conditioning system. 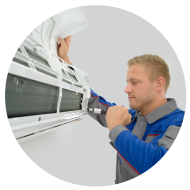 We offer air conditioning installations to both residential and commercial sites. Whether you’re at home or at work, you’ll never have to worry about sweating in the summer heat. We install units from reputable brands such as YORK®, KeepRite®, Frigidare and more. Your unit’s filters, fins and coils need regular servicing to function efficiently throughout the year. By getting regular maintenance can affect your unit’s overall efficiency and your air quality. With a properly maintained unit, you can lower your AC’s energy consumption by 5-15%. If your air conditioner breaks down, call Budget Choice Heating & Cooling to repair it. Our team of technicians offer emergency repair services 24 hours a day, 7 days a week for prompt results. If there is a problem with your water tank that cannot easily be fixed, you may have to replace it. We offer hot water tank removal and installation services for broken or outdated tanks. An upgrade to your hot water tank may mean an increase in energy efficiency as they use less electricity and gas. Regular maintenance to your hot water tank can save you money in the long run in repair and replacement costs. Flushing your tank once a year can significantly prolong the lifespan of your unit and increase efficiency. Keep your water tank running smoothly with Budget Choice Heating & Cooling. Minor problems such as a hot water tank leak or a hissing sound around the pipes can be cured with a simple repair. If you notice problems regarding your hot water tank, call us and our knowledgeable technicians will inspect the unit, diagnose and repair the problem. We understand that appliances can break down unexpectedly. At Budget Choice Heating & Cooling, our goal is to keep your home or office at your ideal temperature at all times. As a result, we offer emergency services 24 hours a day, 7 days a week. Call us to book an appointment. At Budget Choice Heating & Cooling, we stand behind our work. If we did a repair that breaks down shortly after the service, we will come back and fix the appliance. Our goal is to make sure your heating and cooling units are functioning efficiently at all times.